At the edge of the Sea of Okhotsk one finds a solemn but colorful menagerie of sights. The bright red and white stripes of the lighthouse seemed bolder against a radiant blue sly. 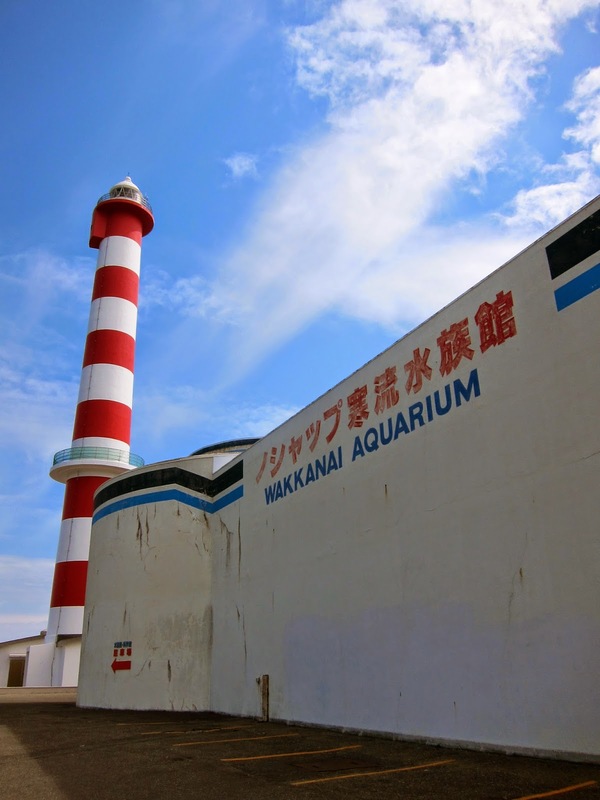 The Wakkanai Aquarium, its walls drawn up like a children’s book, are made entirely from primary colors. I bought tickets to the aquarium, where I was first greeted by the fat sea lions, seals, and small dirty penguins in bright pools of chlorine. 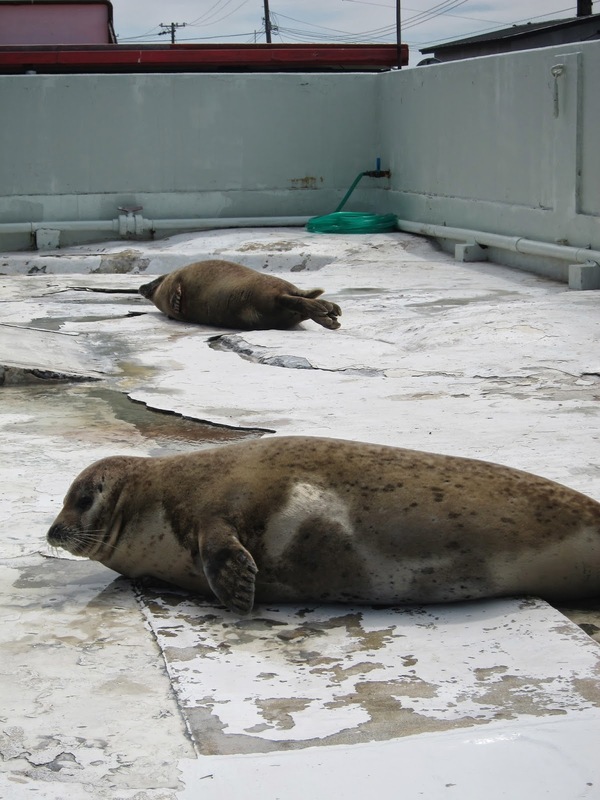 For a couple hundred yen, one family paid to have the aquarium staff feed the seals. Each time the old man threw a fish high into the air, the seals kept their gaze on the sky and fought like dogs as soon as the fish it the water. Three or four times he through the fish and I never tired of this amusing scene. The seal and penguin pools　are outdoors, and can be seen from the aquarium gate. I thought it strange that an aquarium in such a cold part of the world would have outdoor exhibits, but it seemed that most of the animals were from the shores nearby, and thus immune to the cold. Only the human customers of the aquarium might appreciate an indoor exhibit during the winter. One small two story building houses various fish and other sea animals. The course starts from the second floor, with a shallow touching pong. I felt the prickly skin of a starfish and gently poked the needles of a sea urchin. 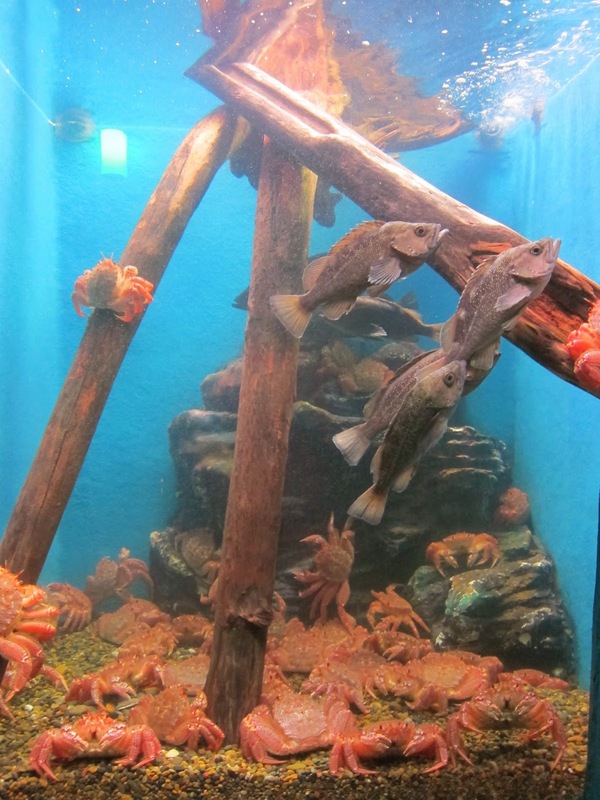 The course then leads the viewer on a winding path of small tanks with crabs, octopus, and fish. The path finishes at a staircase, which directs the patron to the first floor exhibit, a large 360 degree tank boasting fish of all sizes. 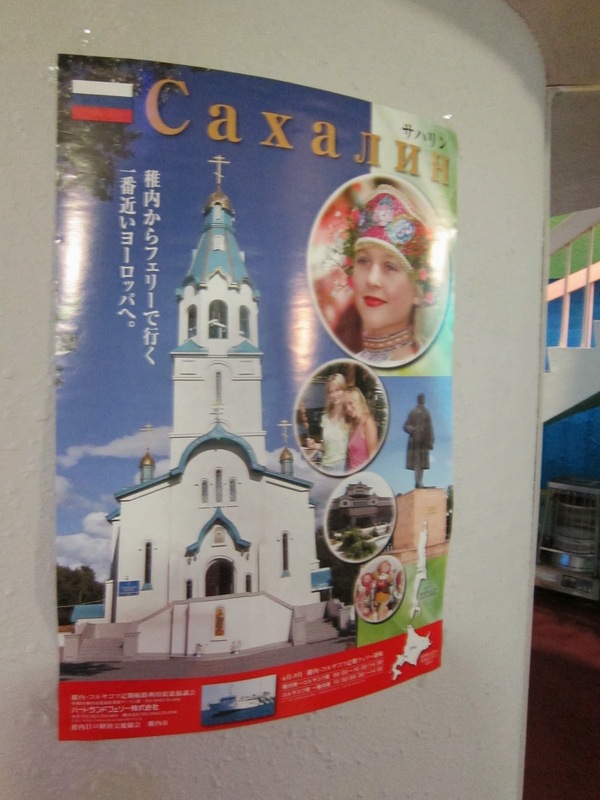 Taped to a column on the first floor, I found a poster advertising Sakhalin, the Russian island just off the coast of Wakkanai. The posted showed the famous Orthodox cathedral, which much be Sakhalin’s only attraction, and several picture of blonde girls. The posted looked like it was from the 80s, and had just never been taken down. After observing all the large fish swim at furious speeds in the circular course of the tank, I excited from the ground floor, stopping to look at the electric eel, who was lighting a tank of red, yellow, and blue light bulbs. I thought people in Wakkanai must love this simple juxtaposition of primary colors, because I saw the pattern everywhere. Hearing an announcement that there would be a show at the penguin pool, I headed to the entrance, for another walk around the outdoor pools. Only then did I noticed a separate cage, disconnected from the main seal pool. Peering out from behind the blue painted bars where two baby seals, lying on their bellies in a shallow pool of water. They seemed so lonely and pitiful. The sign on their cage red, “these are baby seal born this year.” I wondered why they had been separated from their mothers. I stayed a bit longer in the aquarium to see the penguin and seal feeding, an intimate show which was seen by only 10 others besides me. The young staff member from the aquarium had the penguins walk around a little course to receive the food, and exit the pool through a door in a tiny toy house. The seals were trained to scoop up rings with heads and play fetch with a ball. A few rings were given to the littlest children in the audience, and they threw the rings into the pool for the seals to wear on their heads. After the show I quietly left the aquarium. Although it was small, simple, and old, I felt that it embodied the curious character and startling color of Wakkanai.